When given a chance to try other products, rest assured that this guinea pig will jump at the opportunity... especially when we speak of eye shadows. Now that BareNaturals revamped their look, they also did the same for their mineral pigments... eye shadows, baby! Among the eye shadow samples I received was Mod and Glam. Mod is muted gold eye shadow while Glam is coppery orange. For this look, a summer lively look was the inspiration. One thing about our country is that you can't go wrong wearing colors any time of the year. After all, we only have summer and rainy season. Most often people such as yours truly, gravitate towards color with either time of the year. Since there wasn't a proper EOTD for the MAC Penultimate Liner on my previous product review, this author thought to use the said product on this look for your perusal as well. To answer questions, it is smudgeproof and waterproof but not advisable to be used on waterline. It will become available again when the Stlye Black Collection arrives here in our country. Many will agree that when it comes to mineral eye shadows, intensity of the colors are the reason for its popularity. A little goes a long way with these wonder powders. BareNaturals certainly do not disappoint in that department. Evident with the photos above, the intensity of these pigments can rival many mineral eye shadows available in the market and at an affordable price, too. 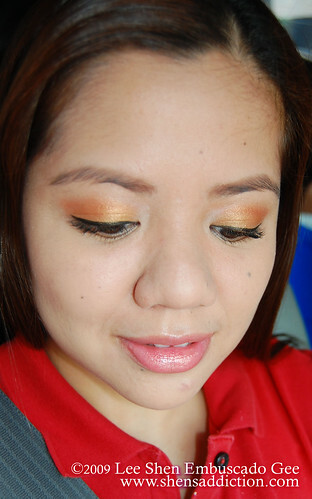 Their eye shadow pigments are only P135.00 ($3 approx.) for a 1g net of product contained in a 5gram clear jar with a fabulous gold cap. BareNaturals and Ellana products for the face and L'oreal Glam Shine for the lips. Foiling method is a technique used in eye shadows to deepen the color even further. One does this by simply using any liquid that is safe for the eyes (ex. water, eye drops or face mists) to mix with the pigments chosen. Easy way to achieve this is by spraying the eye shadow brush with the liquid of your choice and dabbing it on the pigment (on a separate container to avoid contamination) to create a creamy like texture. Apply in a packing motion on to the eyelids, then blend. This will provide a more intensified color of your eye shadow. Foiling method may also be used to transform your eye shadows into eyeliners. 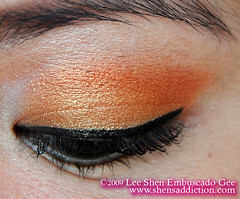 Create many arrays of eyeliners from your eye shadow pigments. This is not advisable to use on the waterline. Try it and be wowed! Til next look and review! BareNaturals are available here and here.